REMEMBER WHEN . . . BURLINGTON HAD AN ICE CREAM FACTORY, SOFT DRINK BOTTLERS, AND A POPCORN WAGON? 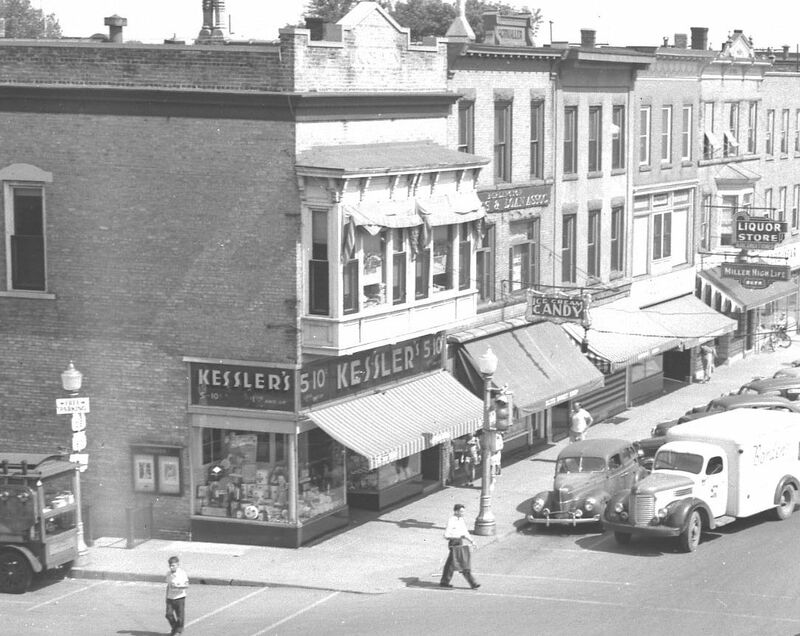 The stores along the east side of Pine Street south of Chestnut Street are seen in this July 1949 photo from the Burlington Historical Society's collection of Free Press photographs. The collection was donated to the Society by the late Elmer Ebert, last owner of the weekly Burlington Free Press newspaper. That paper, which had been started in 1881, was purchased by the Standard Democrat in May 1955, at which time the paper's name was changed to Standard-Press. The rear portion of Floyd and Florence McCormack’s popcorn wagon is seen next to the lamppost at the lower left. The McCormacks operated their business in that spot from the 1940s until 1966. Earlier they had operated at other spots in the downtown area. The corner Jacob Wein building, now occupied by The Coffee House at Chestnut and Pine, was occupied in 1949 by Kessler's Five and Dime store. Edward and Margaret “Marge” Kessler had purchased the variety store business from Nona B. Waterman in 1944. The Kessler store closed in February 1969. Occupants in the upper floor in 1949 included the law offices of Frank Ruzicka and Robert Fulton, Charles Warner’s photography studio, and the office of the Ferd Robers Construction Co. The Elite Sweet Shop was located on the ground floor of the next-door Schwaller building in 1949. Its “Ice Cream – Candy” sign can be seen above the awning. Robert “Al” Giannini and Narciso Andreotti had moved the business into the building in 1920, with Giannini selling his interest to Guilio Marsili shortly thereafter. Later, Marsili also bought Andreotti’s interest. At the time of the photo, George T. King owned The Elite. He sold the business to Mrs. Mildred Krueger and her son, Donald, in 1954. The Kruegers renamed the business Cokes-Me-Inn, operating it until February 1957, when it closed. The Burlington Savings and Loan Association occupied the second floor of the Schwaller building at the time of the photo. Elsie’s, a women’s wear shop, occupied the next building in 1949. Today, the building is occupied by Allison Wonderland (formerly The Card Cottage). Elsie Kneubuhler McEntee had moved her Specialty Shop into the building in 1941. Later known as Elsie’s, Elsie’s Women’s Wear, and Elsie’s Apparel Shop, the business moved to the next-door Schwaller building in the early 1960s. It expanded into the corner (Kessler) building in 1974, and moved to Burlington Square in 1979. Vogelsang’s Bakery occupied the next building to the south at the time of the photo. John and Vera Vogelsang had opened their bakery in the building in 1932. The Vogelsang family, including son Jack and daughter Peggy, operated the bakery until 1982, when it was sold to Mark and Jean Pawluk. Today, the building is occupied by the Beijing Gardens restaurant. 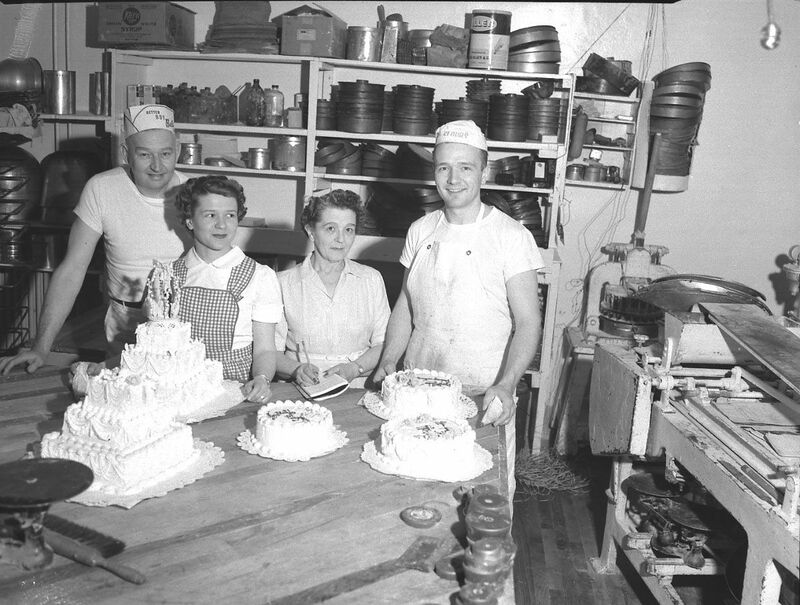 The Vogelsang family - John, Peggy, Vera, and Jack - shown inside the family's bakery in 1952. Next to Vogelsang’s Bakery in 1949, in the building with the second-story bay window, was Donald and Joyce Giannini’s Palm Gardens tavern and Don’s Liquor Store. Below the Liquor Store sign is the notation “Air Conditioned.” The Gianninis sold the tavern business in 1953 to Otto Schatz, Kenneth Forrest, and another partner. Today, the building is occupied by Lucky Mojo’s tavern. Occupying the other buildings to the south at the time of the photo were William Large’s Tire and Appliance store; Paul Schatz’s tavern; William Itzin and Son’s shoe, leather goods, and harness shop; and Harold Kayser and Son’s Midwest Meat Market. Note also the diagonal parking. A mixture of early automobiles and horse-drawn vehicles is seen in this photo, taken about 1904, of the east side of Pine Street between Chestnut Street and what is now Milwaukee Avenue. The photo was donated to the Burlington Historical Society by Jane Wagner Hoganson. The brick building at the right was put up in 1873 by disabled Civil War veteran William Laske. For several years, Laske operated a saloon in the basement while renting the ground floor to other businesses, including clothing and dry goods merchants and, for a couple of years, a cigar manufacturer. In 1881 Laske moved his saloon, which he named Veteran Saloon, from the basement to the ground floor. At the time of the photo, Henry Weygand operated a saloon in the building. The delivery wagon of the Finke-Uhen Brewing Co., which was located on McHenry Street, is seen in front of the saloon. Between Laske and Weygand, others who had saloons in the building included Nicholas Gill, John Wegge and Bruno Bauman, Dennis Forrest, John B. Richter, James Cleary, and William Forge. The Laske building, which shared a wall with the next door Bankes building, was bought by Charles B. McCanna in 1909. To make way for McCanna’s Bank of Burlington building, which today houses May’s Insurance Agency, McCanna had the Laske building moved down Chestnut Street and across the railroad tracks to the property now occupied by the Charcoal Grill. There it served as Walter Uebele, Sr.’s feed company, the condensed milk company’s can plant, a freight warehouse, and Hi-Liter Graphics headquarters. The building was demolished in 2001 as part of Burlington’s riverfront redevelopment project. The next-door Bankes building, with the second-floor bay window, was constructed in 1897 by Francis Bankes for his agricultural implement store. The Bankes store remained in the building until 1907, when William F. Reineman leased the building and moved his hardware business there. The Reineman Hardware store was in the building until 1979, when the business moved to Milwaukee Avenue. After Reineman moved, the Bankes building was occupied by a succession of businesses, including John Godsell and Art Mayer’s Bargains Galore, Mike Ciecko’s M. C. Discounts, John and Connie Catterall’s Sundown Waterbeds, Lynn Koshak and Sue and Jack Stardy’s Bulletin Publishing Co., and Gordon and Lynn Greunke’s Bulletin Printing and Office Supplies. The building is now occupied by Cyndi and Kevin O’Brien’s Burlington Flowers and Interiors. Brad and Mary Sutherland’s Sci’Fi Cafe now occupies the ground floor of the former Hotel Burlington building, the three-story building in the middle of the photo. The brick hotel building with the sidewalk canopy was put up by John Mutter in 1902. It replaced an earlier frame building that had housed a series of hotel businesses, including the Burlington Exchange, The Exchange House, and The Central House. Mutter, who served as Burlington’s third mayor from 1904 to 1906, sold the hotel business to Robert O’Neill and John T. Prasch in 1912. Other building owners over the years included Joseph and Rose Lohaus, William Liggett and Murphy Products Co., Murphy Enterprises, and William Ebbers. Other businesses beyond the hotel building, whose street signs can be seen in the photo, include Joseph Rittmann’s saloon, called Joe’s Place, now home of John Puntillo’s John’s Main Event; William Reineman’s original hardware store, now occupied by Nancy Belau’s Nancy’s Hair Affair; and Herman Dettman and Robert Hoff’s farm machinery store, now occupied by Al Strelbicki’s Parts & Smarts, Inc. The buildings on the north side of Chestnut Street east of Geneva Street (now Milwaukee Avenue) are shown about 1910 in the accompanying postcard photo published by C. R. Childs of Chicago. The postcard is from a collection that Dr. Herbert Lederer donated to the Burlington Historical Society a few years ago. Dr. Lederer, whose parents operated Burlington Foods on Wilmot Avenue (now S. Pine Street) from 1945 through 1963, graduated from Burlington High School in 1952. The corner building with the corner entrance and the distinctive tower, now occupied by Oldenburg Insurance, was built in 1895 by John P. Gill, who conducted a saloon there until 1900. At that time Gill sold the building to Bernard J. Bushman, whose son Albert took over the saloon business. In 1908, because of health problems, Albert sold half interest in the business to David Denig, who became manager. With the onset of Prohibition, Albert Bushman retired from the saloon business and Denig moved the stock to the former Schumann tavern (later the Harmony Bar) across Geneva Street. The Burlington National Bank started in the corner building in 1920 and remained there until 1960, when it moved to the corner where Town (formerly Talmer) Bank is now located. Upstairs in the Bushman building at the time of the photo were the Doctors Newell – George E. and Frank F. Others with upstairs offices in the building over the years included Dr. O. J. Wolfgram, Louis Rohr, Dr. Stephen A. Theisen, Dr. Marshall W. Alcorn, Dr. Lawrence E. Fait, Dr. B. E. Pippin, Benton Hale, Dr. Arnold Grossman, Richard Vos Accounting, and others. The building next to Bushman’s saloon was also built by John P. Gill in 1895. At the time of the photo, Gill was operating a saloon, named Red Fox Inn, there. Before opening his saloon in 1907, Gill had leased the building to a hardware firm and a succession of dry goods and clothing merchants, including William Rosenberg. Gill operated his saloon until Prohibition, when he rented the building to Louis Wagner and Alfred Juranek, who opened a men’s clothing store in 1919. Wagner and Juranek remained in the Gill building until 1929, when they bought the former J. G. Mathews grocery store building next door and moved the clothing store there. After Wagner and Juranek moved out, the Gill building housed a succession of drug stores, including those of Francis Major, Edward C. Garvey, John F. Henney, and James Stobber. After Stobber closed his Downtown Pharmacy in 1989, the building’s occupants included Fashion Fashion, the Music Mart, the Chamber of Commerce, and the Burlington Area Arts Council. Today, Oldenburg Insurance occupies the building, having expanded into the space in 2004. At the time of the photo, upstairs occupants included the Masonic Lodge and the dental office of Dr. Horace H. Newbury. James G. Mathews’ grocery store occupied the next building at the time of the photo. Mathews had bought the interests of the store’s former owners, Arthur McKercher and William Bowers, in 1898 and 1899, respectively. Mathews also bought the building in 1914. He operated his grocery store until 1925, when Hugo and Francis Rothering bought the business. The Rothering brothers remained in the building until 1929, when they moved their grocery store to the Wehmhoff building next door. At that time, Wagner and Juranek bought the Mathews building and moved their clothing store there. Above Mathews grocery store at the time of the photo was the Burlington Business College. The College had been started in Burlington in 1908 as a branch of Moore’s Business College of Racine. It first occupied rooms over Ebbers grocery store on the opposite side of Chestnut Street (in the three-story building seen in the background) before moving over Mathews grocery store in 1909. The College, which had about 50 students in day and night classes in 1909, offered such subjects as bookkeeping, arithmetic, penmanship, commercial law, rapid calculation, shorthand, typewriting, and letter writing. It remained in the Mathews building until 1913, when it closed its Burlington location. The Wehmhoff building, marked by the large round clock sign, was occupied at the time of the photo by Eugene Wehmhoff’s jewelry store and the millinery shop of his wife, Emma Jucker Wehmhoff. The Wehmhoff businesses had been in the building since 1871. The Rothering brothers’ grocery store, which moved to the building in 1929 after the Wehmhoff businesses closed, operated there until 1941. They were followed by Joseph Rueter and Mark Hannas’ men’s clothing store. Rueter and Hannas occupied the building from 1943 until 1957, when they moved their store across Chestnut Street to the building now occupied by The Shy Violet. Gene Zarek moved his insurance and real estate business into the Wehmhoff building in 1957. The property now occupied by the Pinecrest Shopping Center was once home to a large greenhouse business called the Burlington Floral Co. 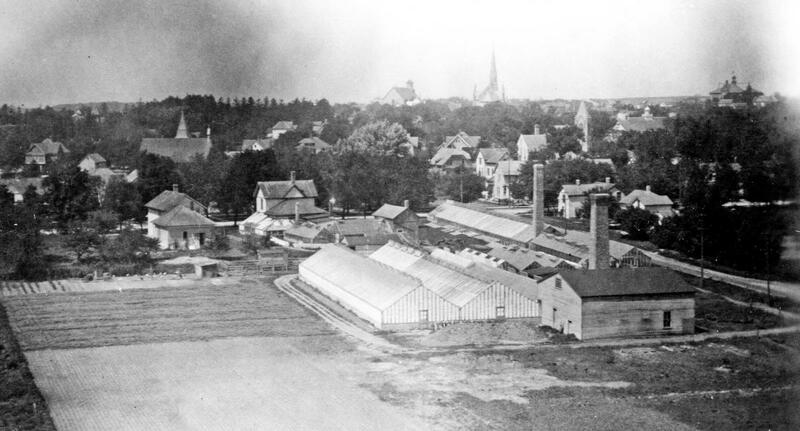 The company’s buildings and gardens are shown in the accompanying glassplate photo taken about 1910 looking westerly from what was then the Badger Basket and Veneer Company. The basket company stood between the railroad tracks and the Fox River. The large buildings on the horizon near the center of the photo are the two St. Mary’s church buildings on McHenry Street. The old Conkey Street (later Cooper) School building is on the horizon at the upper right. The photo was donated to the Burlington Historical Society by the late Renata Storey, whose grandfather, Henry Storey, was employed at the basket factory. The floral business was started by Adolph Helfrich as a sideline. 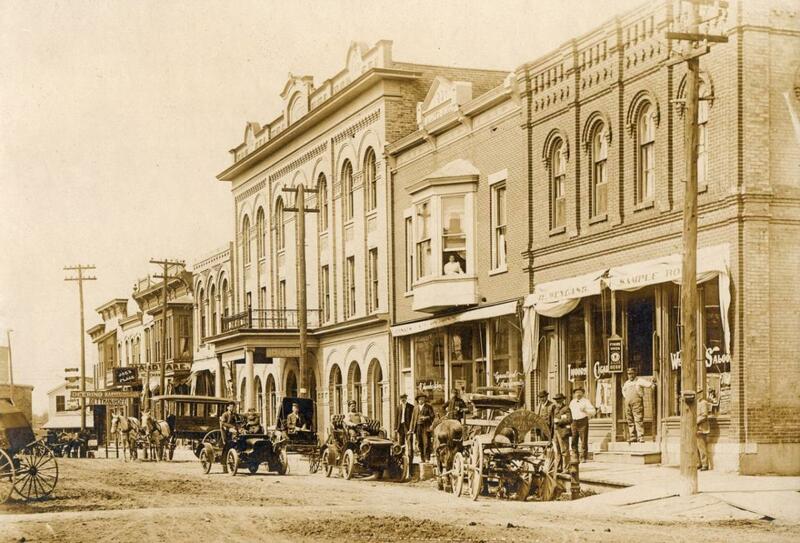 Mr. Helfrich, who had a jewelry and chinaware store in downtown Burlington, bought a lot on Pine Street in 1881 and completed his residence the following year. He later bought property adjoining his residence and put up a greenhouse. In 1900 he more than doubled his greenhouse capacity with a 25 by 160 foot structure using about 8 tons of glass. In 1902 Mr. Helfrich sold his stock of jewelry and chinaware to devote full time to his floral business. In 1903 he built another greenhouse and a chimney 45 feet high, and added another greenhouse the following year. In 1909 he added a boiler house and three new greenhouses each 30 by 130 feet. In summer 1910 the company set out 22,000 carnation plants, and in October of that year was shipping 500 to 800 flowers a day to the Milwaukee market. It expected to ship 1,500 to 2,000 a day during the winter. The plants were started in a marshy area at the rear of the property so that drought would not retard their growth. In 1911 the Burlington Floral Co. won several prizes at a Milwaukee floral show. In May 1912 the worst hail storm in Burlington residents’ memory broke about 800 panes of glass at the Helfrich greenhouses. It also broke practically all the glass panes in the skylights at the Burlington Blanket Co., 20 panes in the skylights at William E. Rein's blacksmith shop, half the incandescent street light globes in Burlington, and a number of arc light globes in the city. In 1914 Frank Mueller, who had assisted Mr. Helfrich in the floral business for many years, bought Mr. Helfrich’s interest in the Burlington Floral Co., as well as the Helfrich residence. The company continued to ship an average of 2,000 carnations a day to the Milwaukee wholesale trade as well as supplying the local trade with flowers and hot-house plants of all kinds. In 1916 the company had a total of 14 greenhouses in constant use. Mr. Mueller opened a downtown flower shop in 1917 in the Reuschlein building on the corner of Chestnut Street and what is now Milwaukee Avenue. Today, the corner is occupied by Johnson Bank. Henry J. Heidermann managed the shop for about a year before accepting a position with the Bank of Burlington. In 1923 the Floral Co.’s downtown shop moved across the street to a first floor store in the then newly constructed three-story Badger Hotel annex. A cyclone in September 1925 broke considerable glass in the company’s greenhouses and blew down a chimney, injuring Henry Storey. Mr. Storey died two days later. In 1927 the company moved its downtown shop to the building on Pine Street now occupied by the Burlington Dance Academy. The shop remained there until 1933, when Mr. Mueller built an office and show room on the corner of what is now Pine and Adams streets. The Burlington Floral Co. continued to operate until the fall of 1942, when it closed following heavy hail damage. In 1943 James H. Murphy bought the Mueller residence and floral company property and sold most of the greenhouses, which were dismantled and moved to Walworth. The office building and a small greenhouse were rented to Mrs. Sadie Brickwood, who opened a flower shop in 1945 using it as a retail outlet for her Union Grove greenhouse. In 1947 Mrs. Brickwood sold her business to Ward Nelson who, in turn, sold the Burlington shop to Thomas Pearce in 1949. Mr. Pearce changed the name from Nelson Flower Shop to Burlington Floral Shop, enlarged the building in 1954, and continued to operate there until 1965. At that time, he moved the business to the former Edward Lohaus residence at the intersection of Pine Street, Henry Street, and Chandler Boulevard. The move was necessitated when the property at Pine and Adams streets was sold and became part of the Pinecrest Shopping Center. The former Conkey Street (later Cooper) School and the former kindergarten building just south of Amanda Street are shown in the accompanying panoramic photo taken about 1910 with an Al-Vista camera made in Burlington by the Multiscope & Film Company. The photo was provided to the Burlington Historical Society by John Pieh, a great great grandson of Leonard Smith, one of the company’s founders. The first kindergarten in Burlington was a private one started in October 1879 by Minnie and Anna Duegherty, two young graduates of the female college at Lake Forest, Illinois. Their kindergarten was located in rooms in the Jones Block over Prasch’s drug store (now site of The Shy Violet). Some time after that, the Burlington school district opened a public kindergarten located in the rear room of the Bushman building at what is now 100 W. Chestnut Street (site in 2013 of the Oriental Healing Oasis and Wellness Center). In September 1886, it was reported that Alice Cooper, the kindergarten teacher, had 56 students. In September 1887, Mrs. Dickens, the kindergarten teacher, was reported to have 75 students. Excavation for the public kindergarten building on Conkey Street (shown in the photo above) started in July 1888, with the building being completed in November of that year. At that time, when the streets of Burlington were not paved, sidewalks were either non-existent or made of planks or stone, and transportation was on foot, by bicycle, or by horse-drawn vehicles, there was no other school in that area. Construction of the larger school building at the left in the photo was not begun until 1896, and that building was not completed until 1897. In an editorial in October 1888, the Standard Democrat, then one of two local newspapers, said that sending young children to the building on the hill was a mistake. The kindergarten building served that purpose until 1911, when kindergarten classes, along with first grade classes, were moved to the re-opened school building, known as Lincoln School (now the Burlington Area School District’s headquarters), at what is now State and Kane Streets. The kindergarten building on Conkey Street, which had also housed manual training and domestic science classrooms, was used for those purposes until 1925, when the new high school (now Karcher Middle School) was built on Robert Street. Thereafter, the former kindergarten building stood vacant, although the school district continued to carry fire and windstorm insurance on it. Because of the mounting financial burden, a resolution was passed at the annual school meeting in 1931 to advertise and sell the building. John W. Peters, who submitted the winning bid, demolished the building and filled in the excavation. The area where the kindergarten building stood is now occupied by the Cooper School building constructed in 1967-68. The larger school building in the photo, known first as the Conkey Street School, was renamed Cooper School in 1940 in honor of former Burlington resident, Congressman Henry Allen Cooper. It housed both grade and high school students until 1925, when the high school classes were moved to the school on Robert Street. The Conkey Street building continued to serve as a grade school until the new Cooper School building opened in January 1968. The building was demolished in 1970 to make more room for playground and parking purposes. Ernest Nagel and Vincent Lois bought L. Harold Longmore’s 2-year-old tire business in the Beller building on “lower” Chestnut Street in 1924 – about the time the accompanying photo, furnished by the Lois family, was taken. The building, erected in 1878, had earlier housed a couple of hardware stores, a dry goods store, a flour and feed store, a meat market, and a series of saloons. Among those running the saloons were police chief Frank Beller, former major league baseball player Frank Roth, Charles Harlow, and Cornelius Betzig. Following a fire in 1918, the renovated building was rented by T. J. Schinners, who opened a short-lived tire retreading and repair firm. Longmore followed with his business. During that period, a gasoline pump was installed in front of the shop. Nagel and Lois added a car painting business, called Re-Namel, at the rear of the tire shop in 1926. They also had Re-Namel shops in the Rueter building on the Hillside and in Delavan and Kenosha. In 1927 Nagel and Lois changed the name of their corporation to Burlington Tire Co. Four years later, Lois bought out Nagel and the other stockholders after which he conducted the business as Lois Tire Shop. In 1955 John Graham became a partner in the business but, on account of illness, sold his interest back to Lois several months later. Vincent’s son, Richard, became a partner in the business in 1962 and took over the firm after Vincent’s death in 1981. The Lois Tire Co. remained in the Beller building until 1983, when it moved to its present quarters on Milwaukee Avenue. Richard’s son, Robert, now operates the business. After Lois moved to the Milwaukee Avenue site, the Chestnut Street building was occupied by a number of businesses, including Burlington Auto Body and Mike’s Bait and Tackle Shop, Tojek’s Bakery, Fox Amusements, Palomino Trading Post, and Just Having Fun Music. The building was razed in 2010. Madison Tire Co., a tire recapping and vulcanizing firm owned by brothers Sam and George Caliva and Walter Beaudry, moved in 1951 from the rear of the Lois Tire Shop on Chestnut Street to a former dry cleaning plant, called Badger Cleaners, on Highways 36 and 83 (now Milwaukee Avenue). The one-story concrete and concrete block building, with adjoining naphtha room, had been erected in 1949-50 by Bohner’s Lake residents Louis Wieseman and Frank Bulak and two associates. 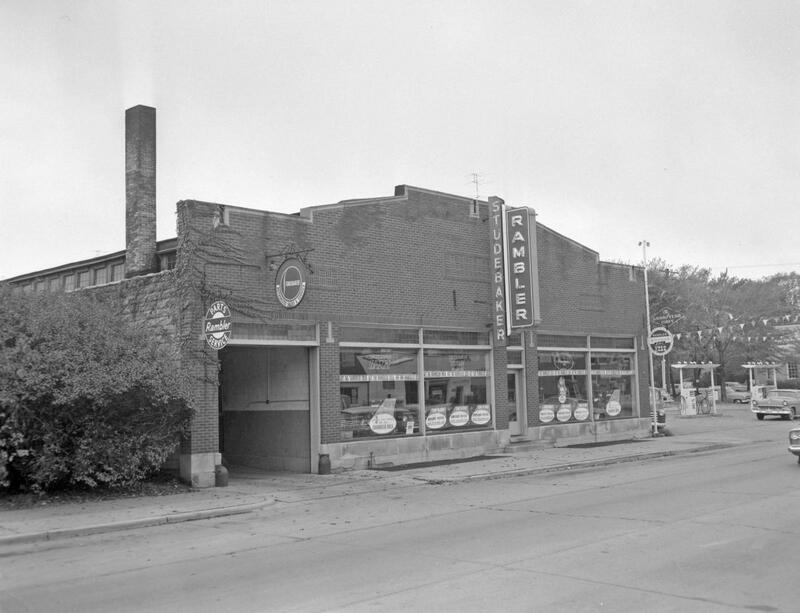 After Badger Cleaners went out of business in September 1950, the building was occupied by a used car business before Madison Tire moved there late in 1951. 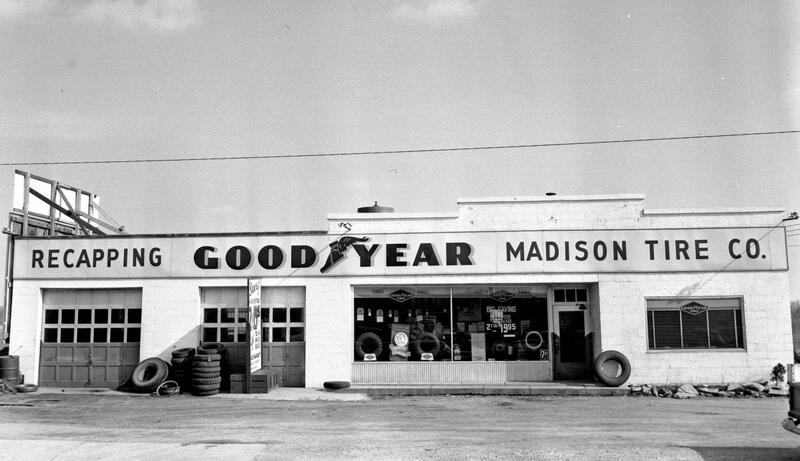 Madison Tire, which also sold new and used tires, added a concrete block service room in 1953 and continued in the building until 1969, when the business closed. In 1971 Jim Chirafisi opened Viking Guns in the building. He continued that business there until closing in 1981. In 1983 Lois Tire Shop moved into the building from its former quarters on “lower” Chestnut Street and has since occupied it. In 1986 Richard Lois opened a mini-warehouse storage complex behind the Tire Shop. The accompanying photo, from the Burlington Historical Society’s collection, was taken in 1963 by Burlington photographer Emmett Raettig. 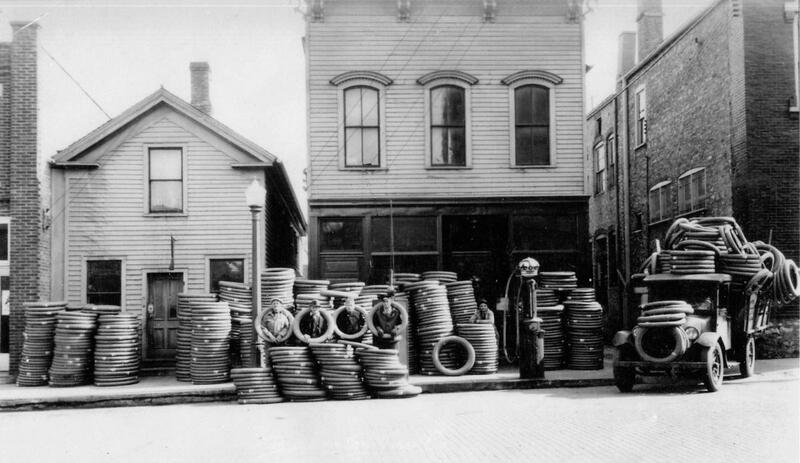 John Jensen, who had earlier had bakery businesses on Pine Street, opened a tire repair and vulcanizing shop in a small building he had put up adjoining his residence on Pine Street in 1917. 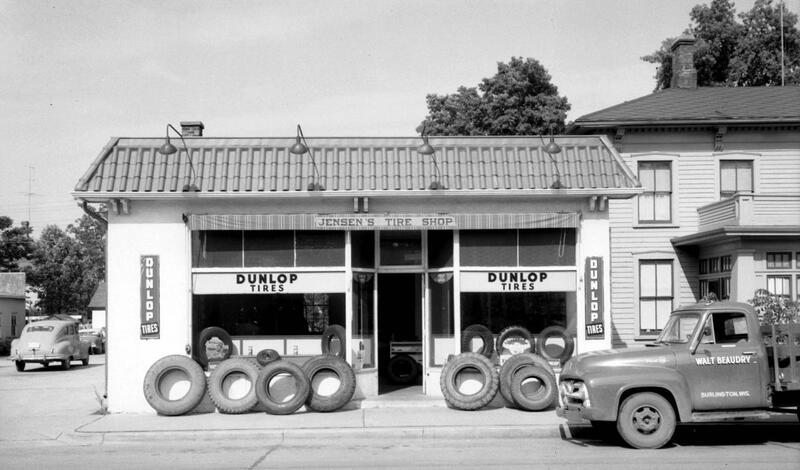 His was the first tire shop in Burlington. He received city approval to install a sidewalk gasoline pump in front of the building in 1921. In 1929 Jensen enlarged the building, putting on a Spanish style front. He added a second gasoline pump in 1930. In 1933 he turned over management of the tire shop to his son, Clarence “Jerry” Jensen, who had been his business partner since 1924. Jerry ran the business until it closed in 1955. At that time, Walter Beaudry bought the business, changing its name to Maco Tire Service. The accompanying photo, by Emmett Raettig, was taken shortly after the transition. After Beaudry closed his business, Luigi and Alice Petracchi opened Luigi’s Restaurant and Pizza House in the building in August 1957. Charles and Dolores Giammo bought the restaurant in July 1976. Subsequent businesses in the building included Hermie’s restaurant, Cornerstone Coffeehouse, JJ’s Donut, Deli, and Coffee Shop, and La Chiquita Mexican grocery store. A fire “gutted” the building in July 2008. George H. Wilbur, a Civil War veteran and partner in the Milwaukee lumber firm T. H. Judd & Co., came to Burlington in 1875 to take charge of the firm’s newly established branch lumber yard near what was then the Western Union Railroad depot just west of McHenry Street. (The railroad was later known as the Chicago, Milwaukee, and St. Paul.) 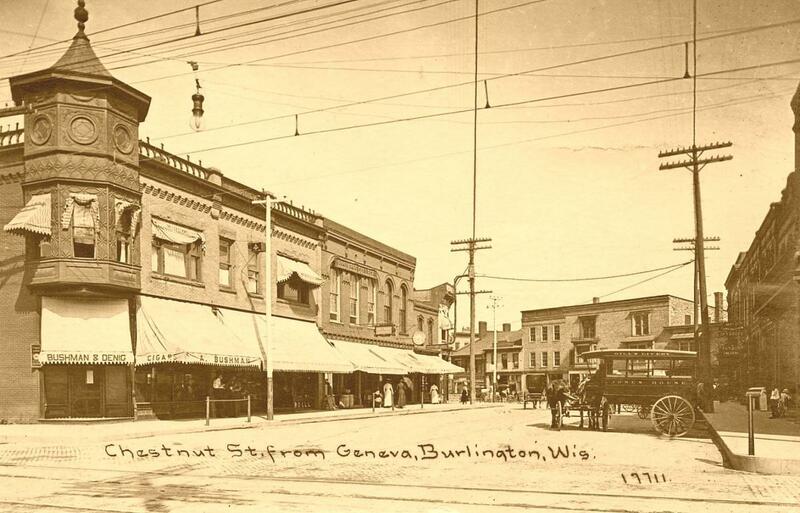 In 1879 Wilbur installed one of the first telephones in Burlington, connecting the lumber yard to the post office, which was then in the drug store of Charles Wood on Pine Street. In 1880 the Judd company established another lumber yard in Springfield, connecting the two yards by telephone. In 1882 Wilbur took over the two Judd branches, operating as George H. Wilbur & Co. In 1885 Wilbur and Mrs. Judd dissolved their partnership and Wilbur, with new partners Royal P. and George G. Houghton, incorporated as the Wilbur Lumber Co. The next year the company established new yards in Honey Creek, Mukwonago, and Silver Lake, building and operating telephone lines to those places as well as to Lake Geneva. Later these telephone lines were sold to the Wisconsin Telephone Co. Also in 1886 Wilbur bought the Pliny Perkins homestead in the block bounded by Geneva (now Milwaukee Avenue), Chestnut, Lewis, and Conkey streets. He built lumber sheds and an office building on part of the property and moved operations there from the depot. By 1892 the company had 15 branches located in Wisconsin, Illinois, and Iowa. In 1893 the company’s general offices were moved to Milwaukee and in 1895 a millwork factory was opened in Waukesha. For some years around 1900, the firm also operated saw mills in northern Wisconsin and upper Michigan and engaged in extensive wholesale carlot lumber transactions. Following George Wilbur’s death in 1922, his sons Ross, Ray, and Hawley and their associates bought controlling interest in the company from the Houghtons; and in 1925 the company put up a brick one-story building on Chestnut Street with a 66 foot frontage and a 24 foot driveway in the center. At its 75th anniversary in 1950, the company had its main office in West Allis, 13 retail yards, and the millwork factory in Waukesha. The photo of the Burlington branch on Chestnut Street is taken from the company’s 1950 anniversary booklet. The company closed the Burlington branch in 1970. The former Wilbur site is now occupied by the Burlington Square building and its Chestnut Street-side parking lot. After almost four years as manager of the Wilbur Lumber Co.’s Burlington lumber yard and another year as a coal dealer and partner in a Burlington hardware store, Hugh G. Dardis, with a few others, started a new company in 1898 to deal in lumber and coal. Calling the business the Home Lumber Co., the firm bought land along Jefferson Street adjoining the Wisconsin Central railroad property for its lumber yard. After changing the firm name in 1908 to Dardis Lumber & Fuel Co., Dardis added a large warehouse, coal elevator, and flour and feed store to its operations. The company also operated lumber yards, for varying periods, in Waterford, Union Grove, Kansasville, and Hartford. In 1920 the firm built an office building and a two-story lumber shed at Jefferson and Dodge Streets and moved its main entrance to Dodge Street. After a March 1944 fire destroyed the office building, lumber shed, warehouse, and other facilities, replacements were built, and the company operated for another 20 years until closing in 1964. In 1959 the company donated the brick and mortar used on three sides of the Veterans Memorial Building. The photo, from the Burlington Historical Society’s collection of Emmett Raettig photos, shows the Dardis facilities in 1952. 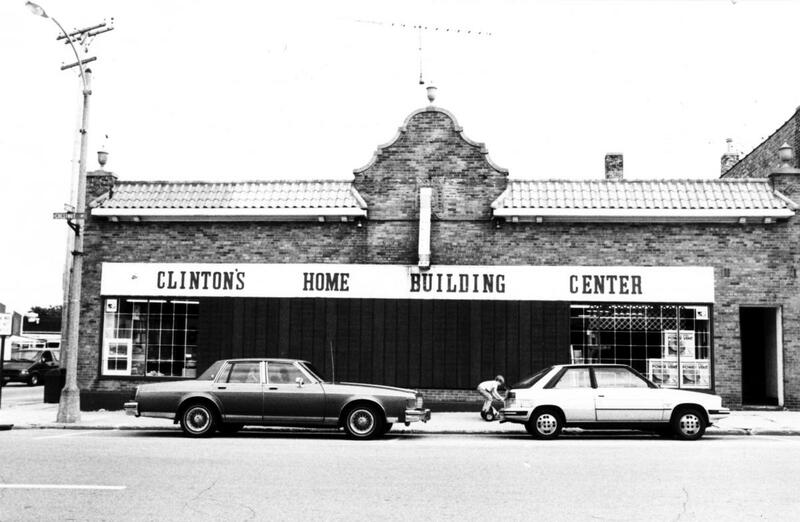 The Clinton Home Building Center opened in 1972 on the southwest corner of Chestnut and Dodge Streets in a building erected in 1929 to house Champion Motor Co., an automobile dealership. Sears Roebuck & Co. and the Burlington Discount Center also occupied the building prior to Clinton’s opening there. In 1981 Clinton bought the property on the opposite – southeast – corner of Chestnut and Dodge Streets and put up two pole buildings primarily for its lumber operations. In 1995 Clinton bought Roberts Bros. Lumber and Millwork on Market Street and moved its operations there. The property on the southeast corner was sold to Burlington Consumers Co-operative; and H. W. Theis plumbing supply business and Adelita's Hispanic food store occupied the former home building center property. An arson fire in April 2005 destroyed the former Clinton building. The photo, taken in 1992 as part of the former Main Street project, is now in the Burlington Historical Society’s collection. John A. Luke, who had been in the automobile business in Burlington since 1914, bought the Ellen Appleyard property on Pine Street in 1921 and razed the house and other buildings to erect a new garage. Lester Coughlin and Anthony Finke of Burlington Motor Car Co. rented the building in 1922 and moved their Ford agency there. In 1934 the newly organized Burlington Rifle Club leased the basement and set up its model target range. Later that year, Finke sold his interest to Coughlin. In 1938 Coughlin and a new partner, W. J. Turner, renamed the business Coughlin-Turner, Inc. 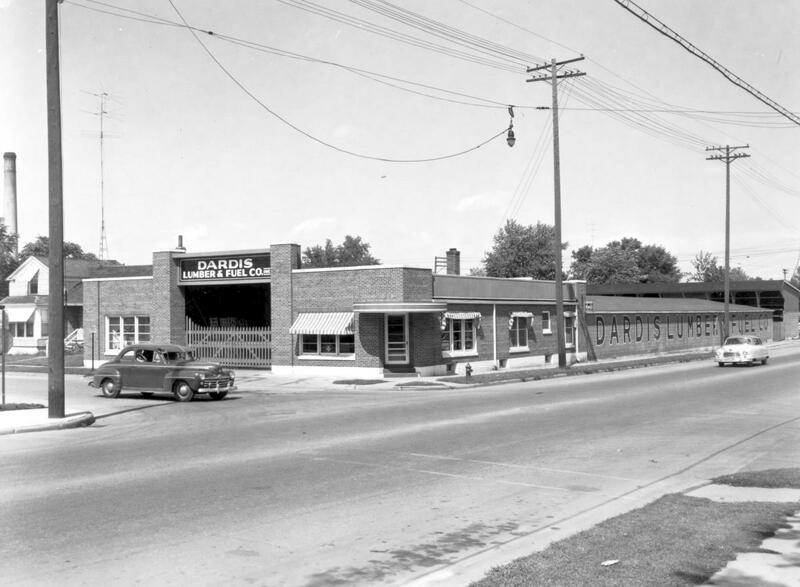 In 1940 Coughlin-Turner moved out and Ted Stang’s Champion Motor Co., Burlington’s Studebaker agency, which had been at Chestnut and Dodge Streets, moved in. For various periods, Rewald Electric and Herman Soetenga occupied portions of the building with their electric appliance businesses and Raymond C. Agner had his Agner Simplex Co. plant in the basement. Stang sold Champion Motor Co., which also held the Rambler franchise, to Robert and Donald Kurtz in 1960, about the time this photo, from the Burlington Historical Society’s collection, was taken by Burlington photographer Emmett Raettig. In 1963 Jim Collins and Cliff Anger took over the business, later giving way to William Bryk and Lester Osenga. Tim Wallace bought the building in 1972 and, with Jim Warras, opened Sports Specialties Co. A trophy shop opened in part of the building in 1973, and racquetball and handball courts were opened in 1974. Bar-restaurants, called Kill Shot, Casey’s, Casey’s Dugout, and Little Pirates Court, then occupied parts of the building until 1983, when a fire destroyed it. A new building was put up, which has since been occupied by a series of restaurants and bars. The 2013 occupant is Brickyard BBQ. In 1927 Hugh Agner sold his garage on Geneva Street (now Milwaukee Avenue) next to the Plaza Theatre and bought the Frank Zwiebel property across the street. He moved the former Zwiebel house to W. Geneva Street (now W. State Street) and built a new garage for his Studebaker agency. In 1929 Union Chevrolet Co., owned by Bryan Roberts and Howard Peterson, bought the building and moved their business from a building just north of the White River bridge (now the site of the Wilson’s Veterans Terrace parking lot). For a time, Roberts also sold Frigidaire appliances (then owned by General Motors) in the building. In 1955 Roberts sold Union Chevrolet to Herman Buelow, who renamed the dealership Humphrey Chevrolet Sales, Inc. 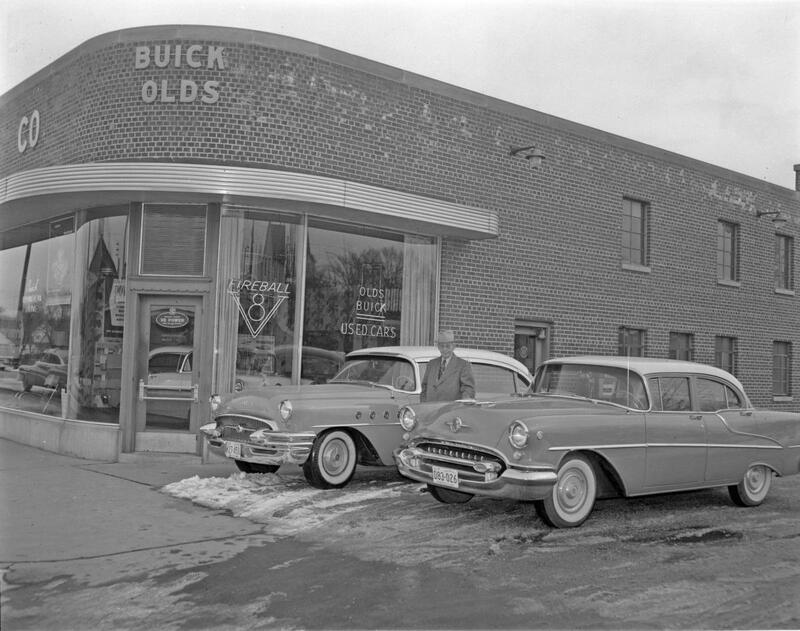 The photo, from the Burlington Historical Society’s Emmett Raettig collection, shows the dealership in 1958. 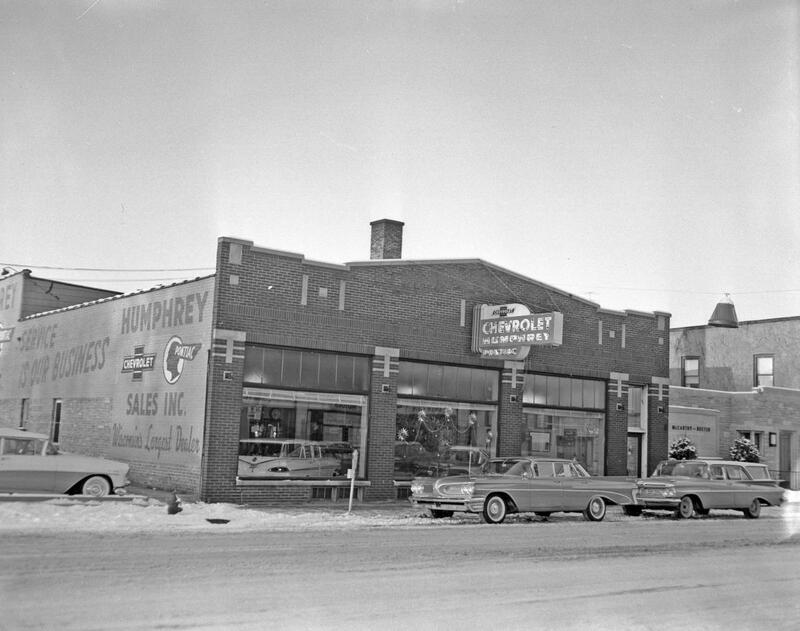 After the Humphrey dealership moved to a new location on Milwaukee Avenue in 1960, Harry Bigelow, Sr., bought the building. The Bigelows used it as a warehouse for their refrigeration sales and service business and later moved their appliance business there. The Bigelow business moved to a new location in the same block in 2012. After Arthur Cunningham acquired the Buick agency for Burlington in 1914, he and his brother, John, opened a garage on Washington Street at the site now occupied by the Korth building. They also handled Overland and Hudson automobiles. After the firm moved to other buildings in 1917 and 1927, Arthur acquired his brother’s interest in the business. (Others with interests over the years included Edward Beller, John Prasch, and Harold Runkel.) Arthur added the Oldsmobile agency in 1932. In 1933 he moved Cunningham Buick to the garage building next to the Plaza Theatre. Arthur passed away in 1937 and, in 1944, his widow, Mrs. Lucy Cunningham, sold the business to Raymond Cunningham, Vincent Siehoff, and Victor Epping. The company bought a site on Jefferson Street near the Soo Line railroad tracks from John F. “Jack” Hansen and built a new garage, moving there in 1947. The photo, showing Raymond Cunningham outside the building in 1954, is from the Burlington Historical Society’s collection of Emmett Raettig negatives. Fox River State Bank now occupies the property. Mukwonago-born Francis E. Kellogg, along with Burlington businessmen Oswald B. Rittman and Edmund C. Johnson, incorporated the Kellogg Ice Cream Company in 1920. 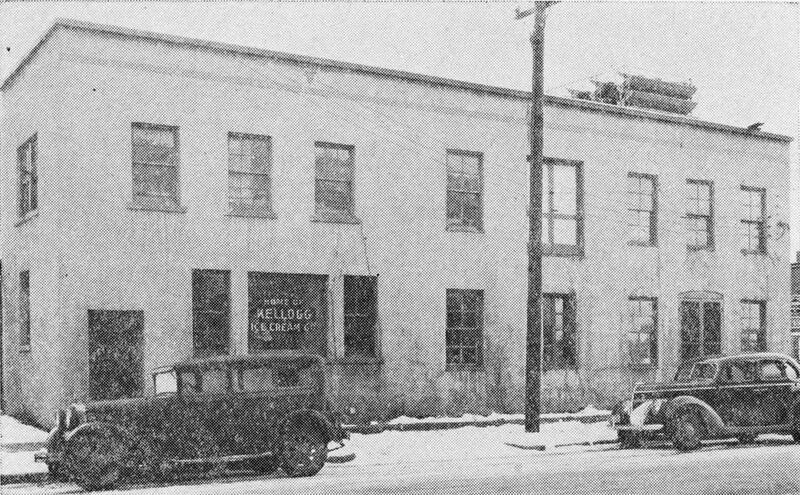 Kellogg and others had earlier bought the former Wagner Brothers machine shop on Pine Street, which had been occupied by the Burlington Motor Truck Co., and converted the building into an ice cream plant shown in the accompanying photo from the 1963 centennial edition of the Standard Press. The plant opened March 1, 1920, making 75 gallons of ice cream per hour using a relatively new “carbonated” ice cream manufacturing process. They called the product “Kellogg’s Klean Kreme” and over the years produced it in many different flavors. In 1921 the company enlarged its cooling room to increase hardening and storage capacity from 2,000 gallons to 3,500 gallons. It also began making chocolate-covered Eskimo Pie ice cream bars under patent rights from the Russell Stover Co. and later added “Icy Hunni” bars, which were similar to the Eskimo Pie bars, except with an orange rind covering. Kellogg sold his interest in the company in 1924 to Edwin Hinchliffe. By 1929 the company was manufacturing more than 1,000 gallons of ice cream daily, with 8 trucks delivering as far north as Big Bend and as far south as Woodstock and Mundelein, Illinois. During summer months in some years, three shifts worked 24 hours a day to meet the demand. The company was eventually sold to the Pet Dairy Products Company and in 1948 the name of the plant was changed to the Pet Ice Cream Co. The Pet company moved from Burlington in 1953. Since then the building has been occupied by a variety of businesses. Soft drinks were made and bottled in Burlington as early as the 1870s when J. E. Eaton of Whitewater started a pop, or soda water, manufacturing business. Later manufacturers and bottlers included August Zoehrlaut, John H. Bower, Frank Howland, George Westrich, and Francis G. Klein and sons Francis N. and Otto. In 1931, while the 18th amendment and the Volstead Act prohibiting the manufacture, sale, and transportation of most alcoholic beverages was still in force, William Kazmaier leased the bottling plant of the former Finke-Uhen brewery on McHenry Street and began manufacturing pop and other soft drinks, which he put up in specially designed bottles resembling an old Rhine wine bottle. In 1935 Kazmaier rented the Wadhams Oil Co. property just north of the Chestnut Street bridge and moved his soft drink manufacturing business there. The building is shown in the accompanying photo from the Burlington Historical Society’s collection of Emmett Raettig negatives. 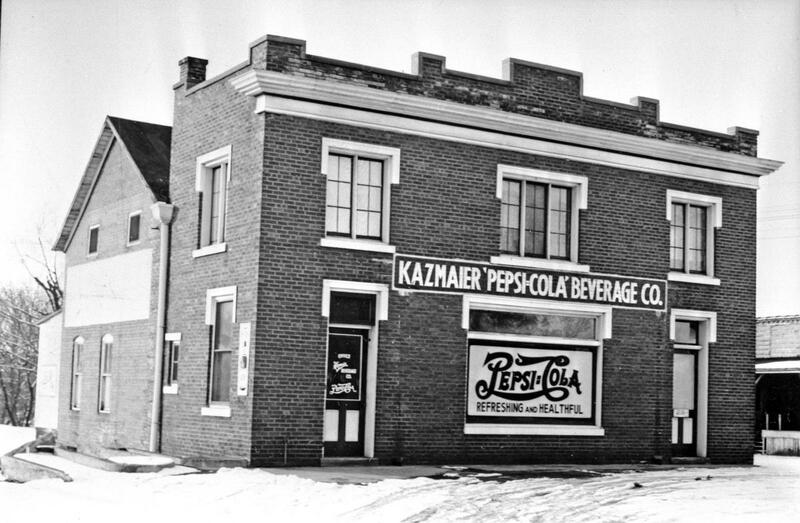 In 1936 Kazmaier obtained a franchise to bottle Pepsi Cola, becoming that brand’s first franchisee in the Racine-Kenosha area. Kazmaier continued his business in Burlington until 1941, when he moved his bottling equipment to Kenosha. Later soft drink manufacturers and bottlers in Burlington included Echo Beverage Co., the Grapette Bottling Co., and the Mission soda division of Weber Brewing Co. of Waukesha. The building shown in the photo was later occupied by Miller Motors and Burlington Cleaners. The property is now a parking lot. World War I Marine veteran Floyd “Mac” McCormack and his wife, Florence, bought Fred Oberg’s 1921 Model T Ford popcorn wagon in 1924. Oberg, who owned the Hotel Badger, had obtained the popcorn wagon in Chicago in 1922. Mac, who was also a cabinetmaker and partner in a short-lived electrical shop and in The Old Town Pump refreshment stand, had earlier been Burlington representative for the Racine Journal-News (now the Journal Times). For 12 years Mac popped his corn and roasted peanuts in front of the Badger Hotel on the corner of Chestnut Street and what is now Milwaukee Avenue. He also obtained the concession rights at Athletic Park and, for a time, branched out with another popcorn wagon in Twin Lakes. When the interurban streetcars were replaced by buses that stopped in front of the Badger Hotel, Mac had to move. After 5 years in other downtown locations, Mac moved his wagon to the southeast corner of Chestnut and Pine Streets, where he stayed in business until 1966. During that time, the McCormacks continued to provide concessions at Athletic Park and also took the wagon to various other community and area activities, including county fairs. The photo, from the Burlington Historical Society’s Emmett Raettig colletion, was taken in August 1958. It shows Mac serving John Clarke, his son Vincent, and father-in-law Charles Heise, who were Chicagoans with a summer home near Lake Geneva. Standing behind Mr. Heise - arm and dress showing - is Gwen Clarke. 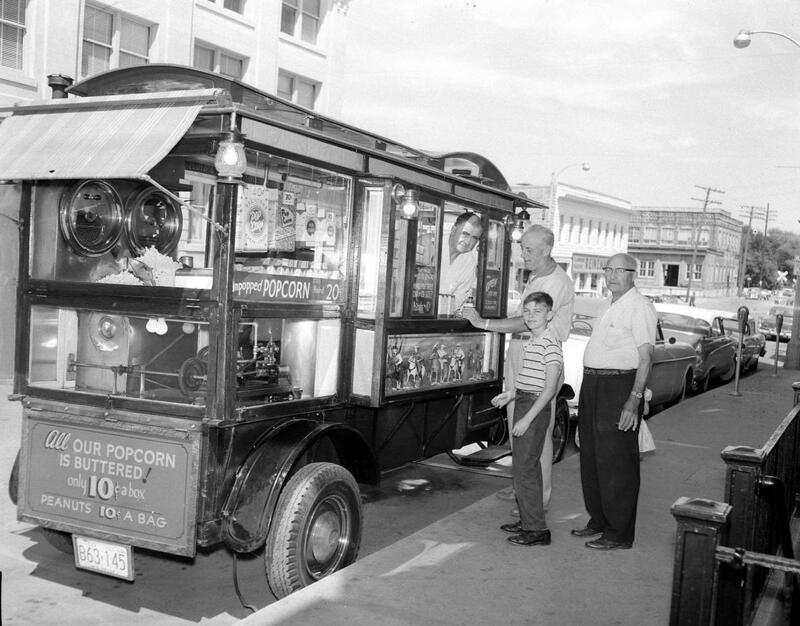 The McCormacks sold the popcorn wagon in 1966, with the buyer moving it to Chicago. Remember When . . . Passengers could board train or rail cars at three depots in Burlington and ride to and from destinations near and far? 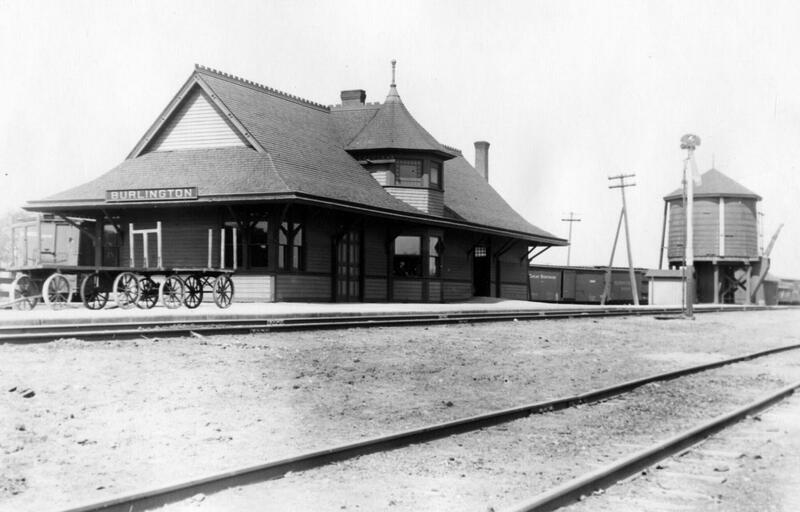 The first train depot in Burlington was a short distance west of McHenry Street near Market Street. Built in 1855 by the Racine and Mississippi Railroad, the depot’s opening was celebrated with the firing of a 6-pound cannon, the music of the Racine Brass Band, a lunch, a program, and evening dancing. Joining the Burlington celebrants were 700 passengers, including Mayor George Wustum of Racine, who rode the train from Racine to Burlington for the occasion. By the end of 1855, the railroad had been extended through Lyons to Springfield with two daily trains running regularly each way. Other depots were open at Racine, Union Grove, Dover, Lyons, and Springfield, with side tracks, engine houses, turn-tables, and water tanks; and depots were going up at Elkhorn and Delavan. The railroad was eventually extended to Rock Island, Illinois. Known later by such names as the Western Union, the Chicago, Milwaukee, and St. Paul, and the Milwaukee Road, the line’s passenger trains ran through Burlington until the age of jet airliners and interstate highways made the service unprofitable. In 1909 the depot, as shown in the accompanying photo from the archives of the Burlington Historical Society, was remodeled to provide separate men’s and women’s waiting rooms and to enlarge the office room. The water tower was torn down in 1954 when diesels replaced the steam engines. The depot tower was razed in 1967, and the depot in 1980. A couple of years later, the line from Burlington to Beloit was abandoned. The Burlington depot for the Wisconsin Central Railway Co.’s line from Chicago to Schleisingerville (now Slinger) was completed in April 1886. Other stations in the area included Silver Lake, Wheatland, Honey Creek, and Mukwonago. The railroad, later known as the Soo Line and now as the Canadian National, built the depot, shown in the accompanying photo from the Burlington Historical Society archives, on what had been Burlington’s fair grounds, where the Racine County Fair was held from 1864 through 1885. Wisconsin Central’s first passenger train, loaded with railroad officials, passed through Burlington on July 2, 1886, on an inspection trip. 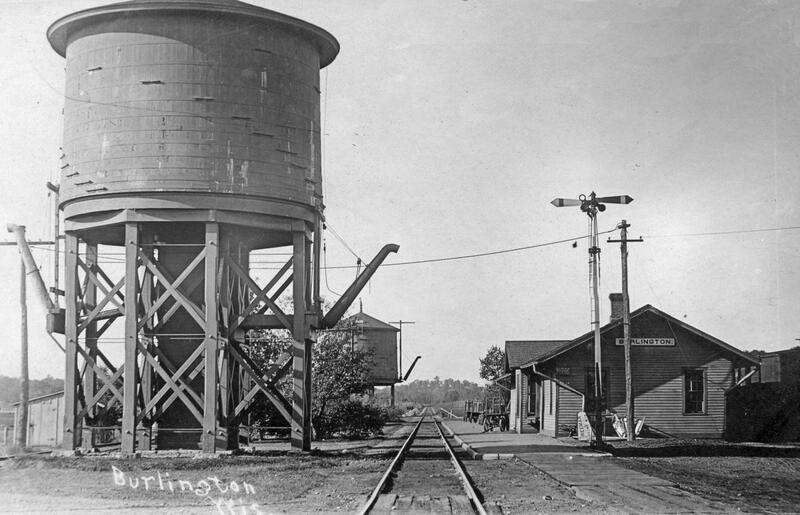 By August of that year, Burlington’s two railroads had 14 passenger trains, 3 accommodation trains, and half a dozen freight trains daily going north, south, east, and west. A water tower was erected before the depot was completed, and an engine house and turn-table were added in 1889. With the addition of the turn-table, a “suburban” (or commuter) train, called the “Burlington Passenger,” made a daily trip to and from Chicago, staying overnight in Burlington. In 1916 the original depot (shown in the photo at left) was moved north to become a freight warehouse and a new depot was constructed. The Soo Line’s passenger service stopped in January 1965 and the original depot was razed in 1969. The Milwaukee Electric Rail and Light (TMERL) Company completed an interurban electric rail line from St. Martins, near Milwaukee, to Burlington in 1909. For a few months, until a bridge was completed, Burlington passengers boarded and got off the cars on the north side of the White River. In 1910 Burlington businessman John P. Gill put up a two-story building (now 520 Milwaukee Avenue) at the rear of his Red Fox Inn on the corner of what is now Chestnut Street and Milwaukee Avenue. Gill lived in the upper story, while the lower floor became a waiting room for TMERL passengers and a “rathskeller.” In 1915 TMERL added a waiting room at the rear of the FritzKarl Hotel (later known as the Badger Hotel and, in 2013, the site of Coach’s Sports Bar and Grill). 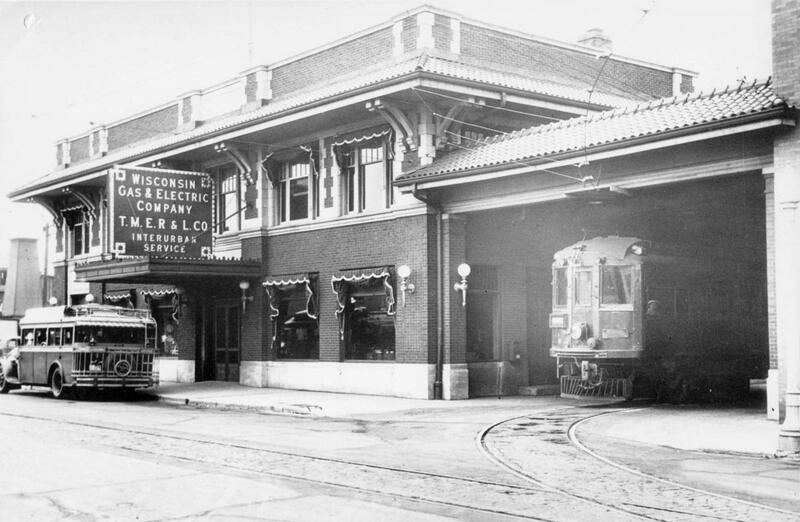 In 1926 the Wisconsin Gas and Electric Co. and TMERL completed a new building and railcar shelter on North Pine Street and moved the TMERL terminal there. The building, which housed the Standard Press offices in 2013, is shown in the accompanying photo from the Burlington Historical Society’s archives. TMERL added bus service to Lake Geneva and other nearby points in 1927. Facing competition from improved highways and the increasing popularity and convenience of automobiles, TMERL’s rail service between St. Martin’s and Burlington ended on May 1, 1938.